Free-machining of stainless steels can be greatly improved by changing the alloying elements within the composition but without drastically changing the basic property characteristics of the material. Some exceptions to the rule can include free-machining grades with high sulfur levels which can lead to a reduction in ductility. Stainless steels are known for their corrosion-resistant qualities given by a complex oxide protective film on the alloy surface. Chromium and nickel are the most important elements which form passive film. On the other hand, most grades of stainless steels are more or less difficult to machine in end-use conditions and are substantially different from that of carbon or alloy steels and other alloys. One procedure for improving machinability of stainless steels is the result of changes in composition by adding sulfur, selenium, lead, copper, etc. Alloying elements serve to reduce the friction forces, transverse ductility and the tendency of the chips to weld to the tool, but they affect functional (corrosion resistance, transverese ductility) and technological properties (machinability, weldability) in a free-machining stainless steel. Therefore, the composition is adjusted to enhance the machinability, but without changing other basic qualities. Some machine operators are interested only in the cutting speed, others in the tool life at a medium cutting speed. However, comprehensive evaluation of machinability is made using the following factors: cutting speed, tool life and surface finish. Additionally, sulfur forms inclusions that reduce the friction forces and transverse ductility of the chips, causing them to break off more readily. The improvement in machinability in the free-machining stainless steels namely Types 303, 303 Se, 203, 430F, 416, and 420F is clearly evident in the chart, “Comparative Machinability of Frequently Used Stainless Steels” (Figure 1). 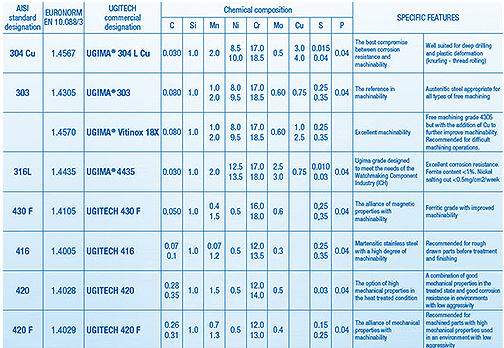 The free-machining grades have significantly lower corrosion resistance than their non-free machining equivalents because of the presence of these non-metallic inclusions; these grades are particularly prone to pitting corrosion attack and must not be used in aggressive environments such as for marine exposure. Free-machining grades containing high sulfur levels also have reduced ductility, so cannot be bent around a tight radius nor cold forged. Because of the sulfur additions these grades are very difficult to weld, so again would not be chosen for welded fabrication. Austenitic stainless steels are generally regarded as being difficult to machine, and this has led to the development of the free-machining Grade 303. The chromium, nickel, and sulfur contents of Type 303 are slightly different than that of Type 304, but its physical and mechanical properties are quite similar. Type 303 can be machined at speeds about 25-30 percent faster than Type 304. Type 303 Se is a free-machining vari¬ation of Type 304 that contains selenium instead of sulfur. Type 303 Se is a better choice than Type 303 when a better machined surface finish is required or when cold working may be involved, such as staking, swaging, spinning, or severe thread rolling, in addition to machining. Type 203 is an austenitic free-machin¬ing grade which is a modification of the 200 series stainless steels. Although it contains significant additions of man¬ganese like the 200 series it also contains nickel and copper. There are also free-machining alterna¬tives to consider in the 400 series stainless steels. For instance, if end-use conditions call for Type 430 stainless, the specifier might select Type 430F. The composition of Type 430F is adjusted to enhance the machining characteristics while preserving as much as possible the qualities of Type 430. The free-machining variation of Type 410 is Type 416, and for Type 420, the specifier should consider Type 420F. 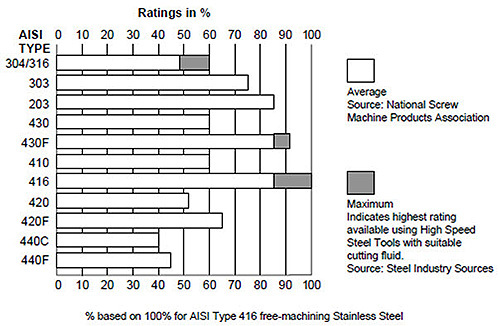 Table 1 compares common grades of free-machining stainless steel grades. This entry was posted in Stainless Steel. Bookmark the permalink.